Every homeowner wants their place to look well looked after and cared for. Not only is this a personal matter of pride, but it also shows that you are proud of your home and your neighbourhood. The only challenge is finding the time to do the work yourself. To make sure that your home always looks its best get in touch with the Action Home Services team. Out of all of the landscaping companies in Richmond Hill, Vaughan, Markham, Toronto, Mississauga, and Etobicoke we have the skills and experience to get the job done right. There is no job to small or large, whether you need your lawn trimmed, an interlocking driveway installed, or a deck built, we are the team for the job. Get in touch with us today to find out how we can work together to make your home the nicest on the street. Here are just some of the residential maintenance services that we provide. An overgrown lawn looks untidy. Even a few weeks of growth in the summer can start to look unkempt. By having the Action Home Services provide all of your landscaping needs you will have a beautifully trimmed lawn all year round. 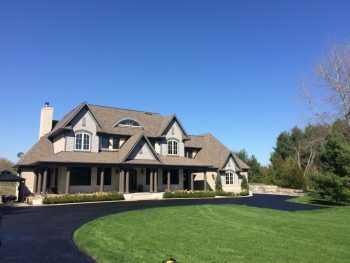 If you are looking for a landscaping company in Richmond Hill, Vaughan, Markham, Toronto, Mississauga, and Etobicoke to fulfil your landscaping needs then look no further. We are expert planters. We are also fully equipped to place sod and mulch down in your garden. One of the key elements to having a healthy looking lawn is providing adequate water. The most efficient way to do this is with a sprinkler system. Having a sprinkler system installed by our team of professionals will allow you to sit back and relax as your grass and your plants get the water they need to grow big and strong. When Spring weather hits and the snow and ice retreat your front and back yard are probably going to be in need of a facelift. The Action Home Services team is able to sweep in and get your garden presentable again. For many plants, the Spring is the best time to plant them. With our many years of experience planting at this time of year we know what will grow the best in the Richmond Hill, Vaughan, Markham, Toronto, Mississauga, and Etobicoke area.